On April 19, 1961, the Rev. Dr. Martin Luther King, Jr. delivered a stirring sermon in a most unlikely place. Though not his most famous address, Dr. King’s words to the Southern Baptist Theological Seminary or simply Southern Seminary pushed the audience to do more to accomplish racial justice. Delivered to the flagship theological institution of the flagship denomination of Southern Culture, Dr. King would never again give another address like this. The Southern Baptist Convention originated from a desire amongst Southern Baptists to keep their slaves and Jesus too. For many of the early years, Southern Seminary reflected the staunch racist and segregationist attitudes of Southern Baptists. After many years of secret and segregated courses, Garland Offutt became the first African-American graduate of Southern Seminary in 1943. By 1947, Southern Seminary was fully integrated. To put this in perspective, Duke Divinity School did not integrate until 1961 and Candler School of Theology at Emory University did not integrate until 1965. Who would have thought that the flagship seminary of Southern Baptists led the way amongst major theological institutions in the South on race? In December of 1960, Dr. Henlee Barnett secured an invitation for Dr. King to deliver the Julian Brown Gay Lecture from the Guest Lectureship Committee. Knowing that the invitation would be controversial, Southern Seminary President Duke McCall told the committee, “Boys, it is your call, but you do realize you are going to cost us hundreds of thousands dollars if you proceed.” Dr. Barnette replied, “If so, it will be money well spent.” Dr. King accepted the invitation and responded with a title, “The Church on the Frontier of Racial Tensions.” By the time April arrived, there were security concerns and controversy brewing throughout the Southern Baptist Convention. The Dr. King that is heard at the beginning of his address to Southern Seminary is not the same Dr. King that was later remembered as one of the greatest orators ever. Stumbling over his words, Dr. King is clearly nervous. However, once he got in the flow, Dr. King never turned back. Speaking about the role of the church, Dr. King pushed the gathered to “…develop a world perspective.” Speaking about race relations, Dr. King declared that racial injustice is “…diametrically opposed to the underlying philosophy of Christianity.” Speaking about economic injustice, Dr. King declared that people must, “…learn to live like Jesus.” Pushing the congregation out the door, Dr. King declared, the gathered must be “…maladjusted to the evils of this age.” The only African-American seminary student in attendance at the time, Dr. Emmanuel McCall remembered, “It was powerful…I felt like the direction of many lives were altered that day.” Though controversy did cause Southern Seminary to lose money, I have to agree with Dr. Barnette that it was money well spent. 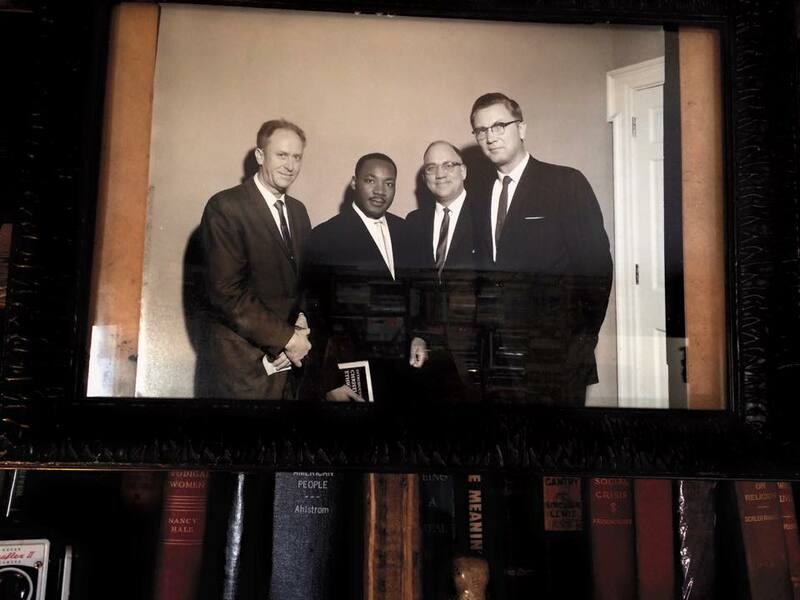 In 2008, close to fifty years after Dr. King’s sermon, I was a student struggling at a radically different Southern Baptist Theological Seminary. Following denominational conflict, Southern Seminary became one of the most fundamentalist theological institutions in the nation. Due to some radical changes I experienced, I dramatically changed my perspective on a number of issues of social justice. When I was searching for direction and didn’t have many places to go, I discovered the story of Dr. King’s sermon. Realizing that there was a way to follow Jesus beyond the narrowness and bigotry I had known, I started following the advice contained in Dr. King’s sermon and began working to develop a world perspective that equipped me to fight against injustice and be maladjusted to the evils of this age. Presently, I work as the Minister of Social Justice for the social justice ministry of the Cathedral of Hope United Church of Christ, the largest LGBT church in the world. Without the courage of the earlier professors from the Southern Baptist Theological Seminary and the witness of Dr. King, I doubt I would be here. I pray that maladjustment to injustice continues to spread. We are all so grateful you became who you are today, and that you continue the work for social justice and inspire so many more. I wish I had a better understanding of what people mean when they use the words SOCIAL JUSTICE. Those words set off alarm bells in me that those who use those words want to use coercive power of government to limit personal choices.